Too Much Sugar relates a story of Mr. & Mrs. Sugar-Pants who dine on a rooftop apartment every evening. Even though they eat a healthy diet, they play a game of hide and seek with each other for the chocolate treats. A terrible predicament occurs. 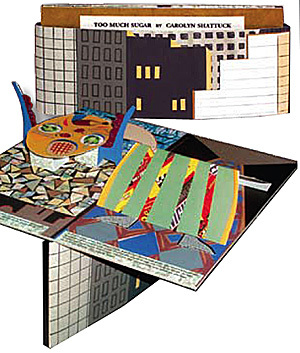 The pop-up book was made from collaged monotypes that were photographed and digitally printed on Enhanced Matte paper and Lami Li paper. The sleeve of the book opens as a cityscape and stands upright to support the rooftop and interior hallway. Size- 10” x 5” x 5”, wt.- 5.6 ozs. Edition of 100, $150.00.